New Orleans has a serious legacy with food. 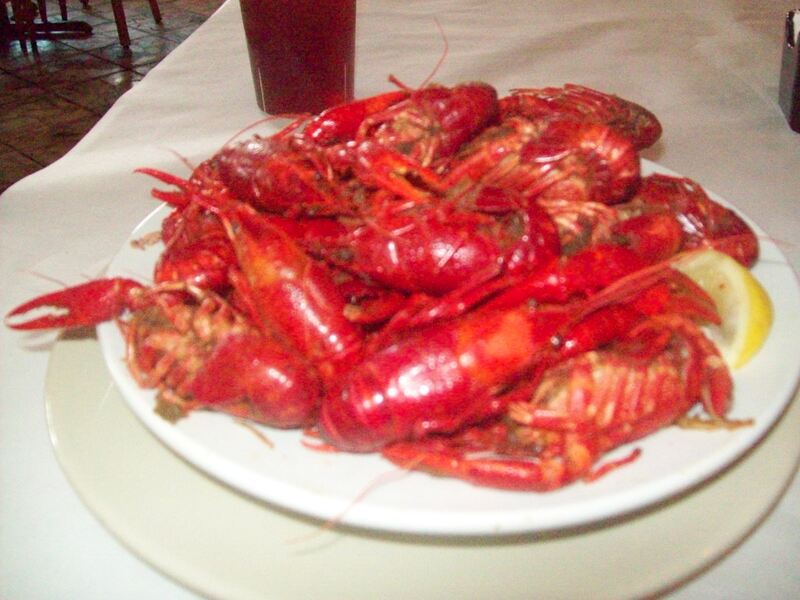 Influenced by Native American, Spanish, French, and African American cultures and mixed with local ingredients, the Big Easy maintains a tradition of fine Creole and Cajun dishes that have interesting histories. Drinks flow heavily as well. The concept for the cocktail was first mixed up here, then followed by a number of potent concoctions still on tap. Even the local coffee is perked with a distinct chicory flavor, and during Mardi Gras, the King Cake, a colorful sugared specialty, is sliced up. 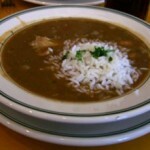 Not sure what dishes to try out on your visit to NOLA? Start by ordering these common foods and drinks while learning how they came about. 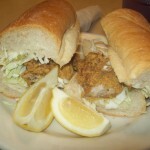 A French bread sandwich, the po-boy (or po’boy) comes in different varieties that any sandwich maker can dream up. Hot roast beef po-boys dripping with gravy is one option. Fried seafood such as shrimp and oysters are the most popular versions,but hot or smoked sausage, ham and cheese and hamburger are also common. The most unusual is probably the French fry po-boy, which simply pairs French fries, gravy and condiments within the French bread loaf. The term “dressed” means your order will come with a topping of shredded lettuce, tomatoes, mayonnaise and pickles. 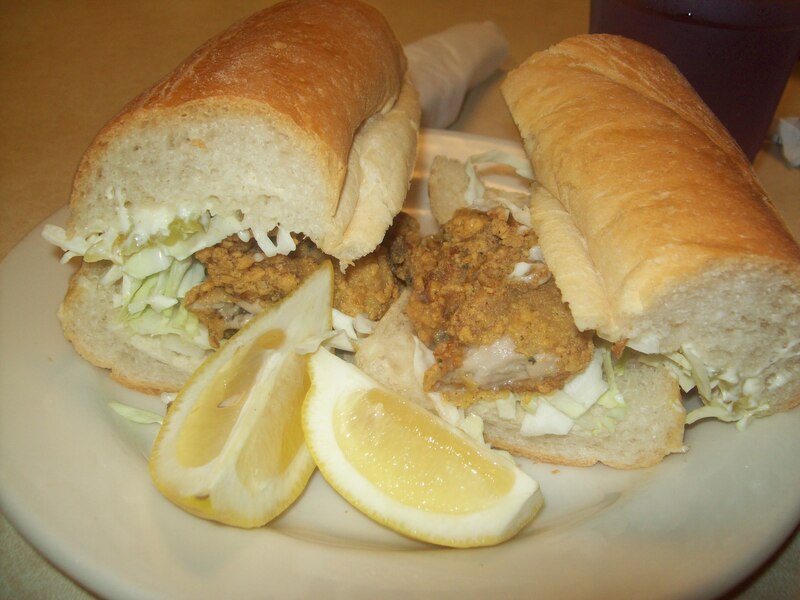 Johnny’s Po-Boys on Saint Louis Street is a pretty good stop for trying this versatile sandwich, while Mother’s Restaurant on Poydras also is recommended. 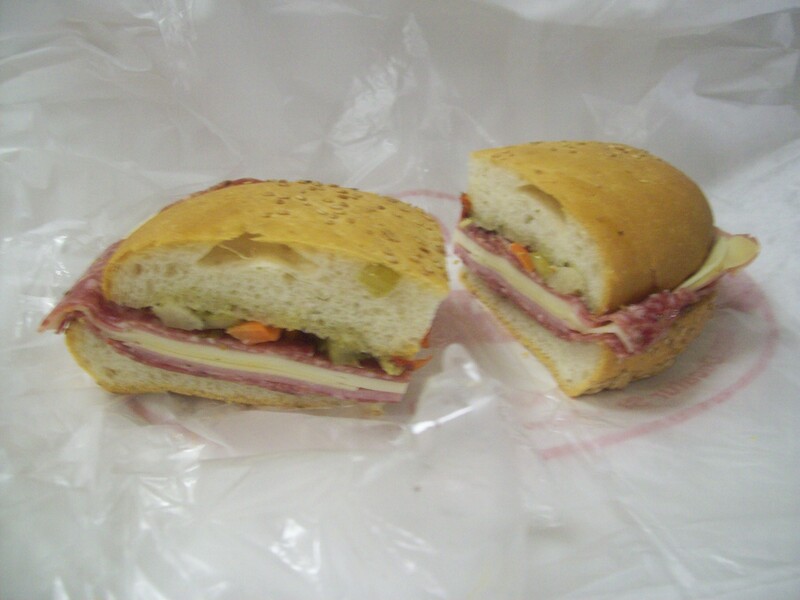 Size-wise, a muffaletta can be a quite big serving, as one sandwich easily can feed two people. 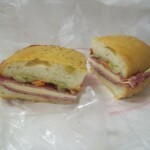 This sub-style sandwich is made with Italian meats such as salami, pepperoni, and capicola, along with provolone and a special olive salad on Sicilian bread. It’s often sold as a full size or as a half. Found at delis, the muffaletta originated at Central Grocery Co. and still made there to this day. Though primarily served cold, try a warmed-up version of this sandwich at Napolean House, a bar/restaurant also is noted for serving Pimm’s Cup, a lemony gin-based British drink. Gumbo is a stew or soup that consists primarily of a strong stock, meat or shellfish, a thickener, and a vegetable trinity of celery, bell peppers, and onion. It’s is often categorized by the type of thickener used: the African vegetable okra, the Choctaw spice filé powder, or the French-base made of flour and fat called a roux. It’s traditionally served over rice. Creole gumbo generally contains shellfish, tomatoes, and a thickener, while Cajun gumbo is generally based on a dark roux and is spicier. Sausage or ham can be added to either variety. 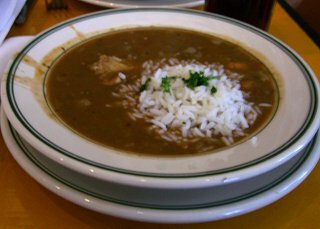 You can get your fill of gumbo at just about any restaurant and even go a bit further at The Gumbo Shop on Saint Peter Street. Similar to Spain’s paella, jambalaya is traditionally made in three parts, with meats and vegetables, and is completed by adding stock and rice. There are two primary methods of making jambalaya. 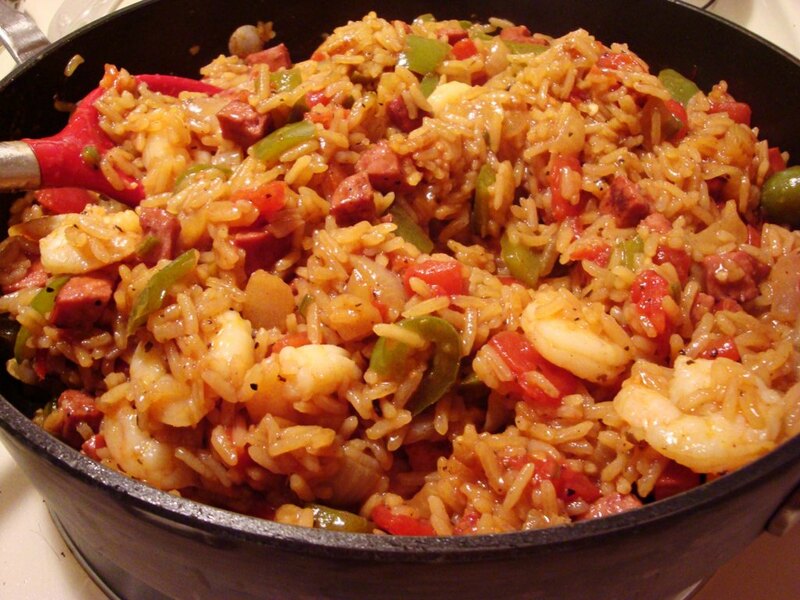 The first and most common is Creole jambalaya (also called “red jambalaya”). First, meat is added to what’s called the holy trinity of celery, peppers, and onions. The meat is usually chicken and sausage such as andouille or smoked sausage. Next vegetables and tomatoes are added to cook, followed by seafood. Then rice and stock are added. The second style, more characteristic of southwestern and south-central Louisiana, is Cajun jambalaya, which contains no tomatoes with the bits of meat that stick to the bottom of the pot are what give a Cajun jambalaya its brown color. Found in many restaurants, good suggestions for jambalaya are at Coop’s Place on Decatur Street, a local watering hole, or the more upscale Pelican Club on Exchange Place. 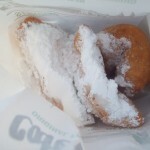 Beignets are square French-style doughnuts, fried and graced with powdered sugar, served in orders of three. 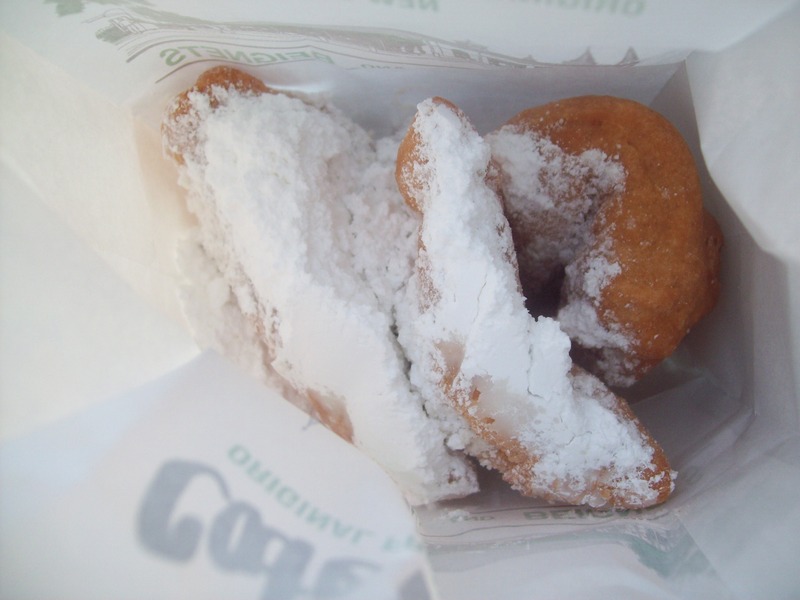 Beignets were brought to Louisiana by the Acadians; these were fried fritters, sometimes filled with fruit. The best place to enjoy them is at Cafe Du Monde, a longstanding coffee shop in the French Market, which be purchased with milk, the local coffee or cafe au lait. In the New Orleans style, the coffee is blended with chicory. A fruity red rum drink, Pat O’Brien’s bar and restaurant on Bourbon Street is cited for creating The Hurricane during World War II, when certain liquors such as whiskey and bourbon were in short supply. Yet rum at this time was quite accessible. The Hurricane was named after the hurricane lamp-shaped glasses the first drinks were served in. Today, patrons can purchase a hurricane glass (sold in a box) from O’Brien’s as a souvenir. To help your stomach and satisfy your appetite, also get a meal at this establishment. Brennan’s Restaurant may be noted for its breakfast spread, but its key to fame is much sweeter with the invention of bananas foster. Created in 1951, this banana-flambe dessert gets its name from NOLA resident Richard Foster, who served with Brennan’s founder Owen Edward Brennan on the New Orleans Crime Commission, and was a frequent Brennan’s customer. The dessert also took advantage of New Orleans’ stance as the major port of entry for bananas shipped from Central and South America, also during the fifties. Brennan’s website boasts that 35,000 pounds of bananas are flamed each year in preparing this dish. Said to have immigrated from France to the banks of the Mississippi River, pralines are a sweet disc-shaped treat made of cream, sugar, butter, and pecans. This candy can be found in most convenience stores and supermarkets, as well as in gift shops. Many praline specialty shops are located in the French Quarter with some of these businesses tracing their roots far back, such as Laura’s Candies, established in 1913, on Chartres Street, or the even older Evans Creole Candy Factory, started in 1900. Other stops for sampling are Aunt Sally’s Pralines, also found on Decatur Street, and Leah’s Pralines on St. Louis Street, and New Orleans Famous Praline Company, on Royal Street. I love their names;Po-Boy, Muffaletta, Gumbo, Jambalaya and Beignets! 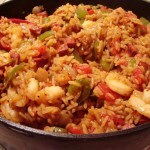 I especially love the Jambalaya maybe because I love Paella and it’s a complete meal healthy meal! I can’t wait to try all these meals in my next visit! Thank you for the food tips! Thanks Elizabeth. 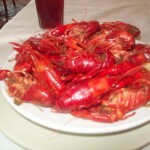 There are many others I can mention such as Shrimp or crawfish Etouffee, which is a really good sauce dish. Thanks! I’ve been driving myself a bit nuts, trying to determine styles of some of the homes posted. And usually it’s because it’s a combo of styles and if I call it one style then someone else will call it another, so I don’t know which way to go with it. You pointed out the very reasons why I was confused, some parts Federal while some Greek along with the date long after Federal would have been out of style. Now I feel a little more sane about it.